LOCATION: To be held at Art Works at 2nd and Dayton. 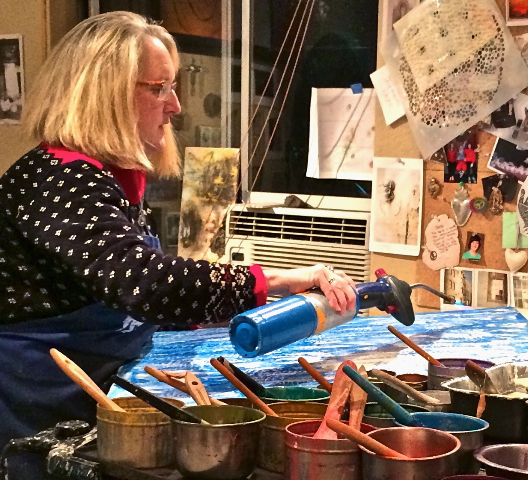 COST: $135 - this fee includes your encaustic medium and other art materials Lisa brings in to share! Please note there is a supply list for students to fill. (See Below) Remember, when you are a student at ARTspot, you receive 10% off art supplies purchases, from the time you are registered and paid through the duration of the class! We are the go-to place for Encaustics! WORKSHOP DESCRIPTION: Create beautiful encaustic wax photo “blocks” with your own photos! Learn the basics of working with encaustic wax (beeswax, damar resin) and photos in this relaxed and informative workshop. The instructor will lead you through all of the steps: studio safety with HOT wax, best papers for photo printing, choosing substrates, preparing surfaces, adhering and encasing photos in wax. You will also learn mixed media techniques for altering your photos. The process is both user-friendly and fun! You will leave with a few beautiful pieces ready to hang on your wall. All levels welcome! Remember, when you are a student at ARTspot, you receive 10% off art supplies purchases, from the time you are registered through the duration of the class! All items marked with ** are available at ARTspot. • 4-6 (or more) 3x3", 3x5", 4x6" or 5x7” PHOTOGRAPHS (BLACK & WHITE AND/OR COLOR) printed on 24# plain printer paper, or MATT photo paper/presentation paper or anything you wish to experiment with, from your inkjet or laser printer, PLEASE DO NOT print on Glossy PAPER or very heavy paper (we will be working on 4X4", 5X5" 5x7” and 8x10” MDF AND/OR WOOD CRADLED PANELS PANELS, which are available at ArtSpot), YOU CHOOSE WHICH SIZES OF BOARDS YOU WISH TO WORK WITh DEPENDING ON THE PHOTOS YOU BRING IN. (You may want to have a beautiful,decorative waxy border around your photo, so plan for that when you purchase your boards.) NOTE: I will also be bring photos for you to work with and practice with! • 4 OR MORE 4X4", 5X5", 5x7” or 8X10"” MDF boards AND/OR CRADLED WOODPANELS** (avail. at ArtSpot) You can purchase art boards as you go throughout the class. That's what is handy about the studio at an art store! • Pinata or Jaquard Alcohol Ink** 1-3 colors, I highly recommend trying these. ARTspot has a great selection. • Bring a sack lunch, or you can buy sandwiches at many local eateries or the bakery - we will take a 45 minute lunch break and time to move your car. IMPORTANT NOTE: If you wish to attach your photos to your boards (MDF board, cradled wood panels or Masonite panels) before you come to class, use white PVA glue or matt acrylic gel medium (even Elmers white glue should work). Burnish (rub) the glued photograph very well, and if possible, “weight” it down with a heavy book or similar while glue is drying. Please make sure none of the glue is exposed, because wax will not stick to the glue. Allow 24 hours to dry. Otherwise, we will your attach photos to your boards, in class, with encaustic wax. ** means we have it at ARTspot and as a registered student you get 10% off!